1945 and the close of the Second World War brought with it an end to the systematic use of concentration camps with the sole aim of exterminating and eliminating a particular ethno-cultural aspect of a nation’s human population. Europe’s Holocaust experience, the Nazi’s so-called “Final Solution” to the “Jewish problem” in Europe ushered in heightened efforts toward the prevention of systematic acts of extermination. The Holocaust is a typified Jewish experience but was inclusive of many categories of peoples labeled “undesirable,” inferior, or servile (i.e., Slavs, Gypsies, Arabs, and homosexuals, consigned to the bottom of a racial, cultural political hierarchy) in the overall architecture of a “racially superior” Third Reich. 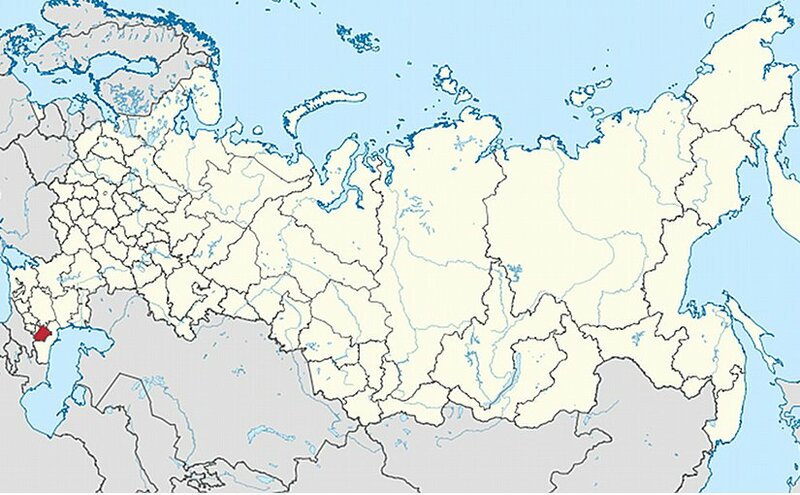 Location of Chechnya in Russia. Source: Wikipedia Commons. Approximately 20 years after these courts resolved that systematic act killing took place in the former Yugoslavia, events that have taken place in the Russian republic of Chechnya in the past several weeks, serve as distinctive reminders of the potential for egregious crimes like genocide to recur. According to reports in the field, since March, local authorities and people acting in coordination with upper-levels of government began actively searching for homosexual men and forcing them into detention centers. Routine physical beatings and other forms of torture, including starvation, humiliation, and death threats, followed initial efforts of identifying, gathering, and transporting homosexuals. These events are described as a “page out of the Nazi’s sadistic playbook” (West, 2017, n.p.). Detention camps have also been referred to as “concentration camps” in the context of Chechnya’s homosexual programs (see West, 2017). They are also distinctively characteristic of Russian programs (the literal meaning of which is “like thunder” and refers to destruction in a more general sense) (see Romaniuk, 2017), linked to widespread violence and killing during the course of the 19th and 20th centuries. Similar to the Nazi program and programs of the previous centuries, mass human rights abuses and what can be accurately classified as state-sanctioned currently being reported on in Chechnya are the product of fervent ideology driven by extreme interpretations of Islam, which shares a political relationship with governing authorities in Chechnya. Efforts in the region are supported from below. Just like in previous instances of genocide, not only in Europe but also elsewhere around the world such as Cambodia, Rwanda, and Darfur, to cite a few cases, efforts in Chechnya are aided by public support from below and government support at higher levels. Homosexuals have been classified as a “threat” to Chechen society, owing to a particular worldview and interpretation of religious doctrine. Such connections can aid in further building support for a cause like genocide and what Daniel J. Goldhagen (2009) refers to as “eliminationism.” Building connections to a larger (in this case) religious movement, fuels the momentum of ideas that translate into individual and collective action with relative smoothness. Other elements such as fear, especially by perpetrators themselves, and various forms of propaganda serves as a further push factor. During the first few years of the 19th century, Russian programs were so successful in their devastation and lethality that Jews formed protection groups (Romaniuk, 2017). A sense of religious responsibility and societal norms are used as justificatory bases for perpetrating violence against homosexuals and their fundamental rights. Intolerance and blindness over “beliefs” have resulted in many attacks and deaths of lesbian, gay, bisexual, transgender, and queer (LGBTQ+) people and their supporters in many places around the world. For example, up to 400 people have reportedly been killed between 2003 and 2007 in Iraq for their sexual orientation (Buckley, 2007), while in Brazil, around 2,680 people have been murdered between 1980 and 2006 for the same reason (PinkNews, 2008). In other cases similar to Chechnya, the government has encouraged the violation of homosexuals’ rights. Uganda, for example, in 2014 enforced an anti-homosexuality act to criminalize homosexual acts and to jail homosexuals (Houttuin, 2015). However, the act was later annulled in August 2014. Yet, those who supported the act have been trying to find new ways to violate the safety, security, and dignity of Ugandan homosexuals, such as by publishing the names of people suspected as homo- or bi- sexual in newspapers, thus, encouraging vigilante groups to “punish” those people. In 2016, Indonesia raised the issues of gay rights in a public debate, with students in an Indonesian state-funded university having created a support group for LGBTQ+ students. In response to their initiative, many politicians labeled homosexuality a “threat,” and argued that homosexuals would become increasingly dangerous if they were allowed access to the same education as others in the country. Consequently, calls were made for activities related to LGBTQ+ issues to be banned (Kine, 2016). Those remarks resulted into many anti-gay protests and violence against suspected homosexuals and supporters. Due to the fear of being attacked, especially by the Islamic extremist group known as the Islamic Defenders Front (FPI), every LGBTQ+ non-governmental organization (NGO) in Indonesia shut down. The stated aim of Chechnya’s “detention centers,” a word euphemistically referring to “concentrations camps,” and lethal violence that has followed suit, is the total extermination of the gay population in Chechnya. The “gay” discourse can also be used against those who oppose regulations in Chechnya, where the deep-seeded taboo of Homosexuality has forced people to live fake identities so as to conceal their sexuality. Interrogation and torture of allegedly gay men has involved efforts to extract information that would lead to the detainment of other gay men in the area. They are tortured for information with the purpose of rounding-up other homosexuals to fuel the collection others. Indeed, many experts would not be surprised if Russia fails to respond at all to Chechnya’s assault against this particular facet of society – not only an assault against people but also an assault against fundamental human rights and dignity of all people. So far, Russia has illustrated its complacency in light of escalating violence in its already volatile and landlocked enclave. Chechnya’s leader, Ramzan Kadyrov, spoke face-to-face with Russian President Vladimir Putin in 2017, remarking about the apparent lack of violence in Chechnya against homosexuals and no persecution to speak of. His remarks are perhaps disquieting, especially following his previous statement that gays do not exist in Chechnya – a statement that may have foreshadowed Chechnya’s gay purge. Russia’s response, which currently does not criminalize homosexuality, though has stringently contested it on a normative basis, highlights the unresponsiveness by those alleged to have been detained and tortured. Russia’s 2014 law, which outlawed the “promotion of non-traditional sexual relations among minors,” has helped to establish a growing moral position for the uptake of violent anti-LGBT+ activity in Russia (Council for Global Equality, n.d.). The Kremlin’s position was rooted in the claim that nobody has reported any violence to authorities in Chechnya – though authorities have been identified as the perpetrators. With its poor human rights record, and overtly proud position on homosexuality, and the LGBT+ community and what it stands for more broadly in societal terms, Russia’s quiet response is a qualification for acquiescence in Chechnya’s campaign against homosexuality and what could aptly be interpreted as state-sanctioned cleansing or genocide. Scott N. Romaniuk is a doctoral candidate at the School of International Studies, University of Trento. Goldhagen, D. J. (2009). Worse than war: genocide, eliminationism, and the ongoing assault on humanity. New York, NY: PublicAffairs. Hoare, M. A. (2011). A Case Study of Underachievement: The International Courts and Genocide in Bosnia-Herzegovina. Genocide Studies and Prevention: An Interdisciplinary Journal, 6(1), 81-97. Romaniuk, S. N. (2017). Pogroms. In P. Joseph (Ed. ), The Sage encyclopedia of war: social science perspectives (pp. 1352-1354). Thousand Oaks, CA: SAGE Publications, Inc.
Dr. Scott N. Romaniuk completed his PhD at the School of International Studies, University of Trento. He holds an MRes in Political Research, an MA in Terrorism, Crime and Global Security, and an MA in Military Studies (Joint Warfare). His teaching and research specializations include International Relations, Military and Strategic Studies, Security Studies, Terrorism and Political Violence, and Research Methods. He is a Senior Research Affiliate with the Canadian Network for Research on Terrorism Security and Society (TSAS) and a member of the Conflict, Terrorism and Development (CTD) Collaboratory at Michigan State University.